I post a lot of desserts. I love finding new “low calorie” versions of great sweets…for 2 reasons. 1. I have a major sweet tooth, and 2. A lot of people think you can’t eat dessert when you’re watching calories… and anyone who knows me, knows I can’t pass up a good opportunity to prove someone else wrong, especially if I can do it while eating cake! 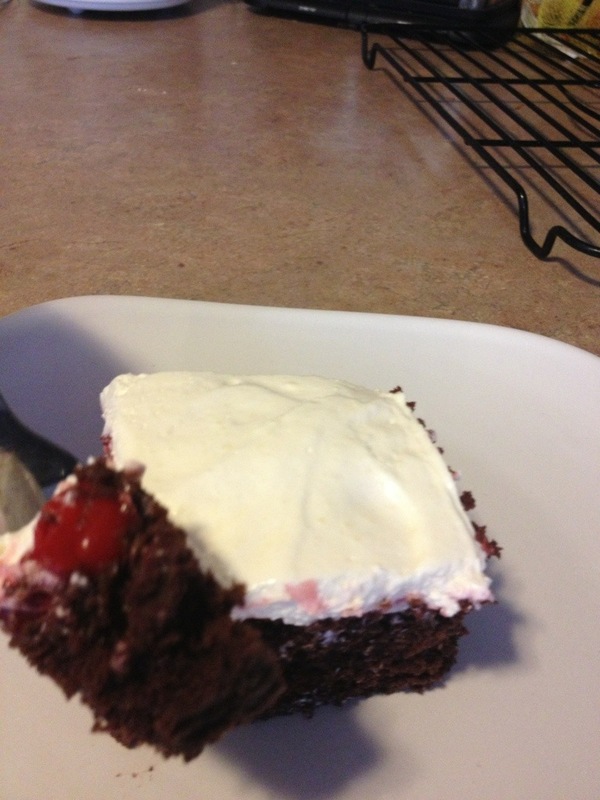 So, anyway, black forest cake has long been one of my favorites, and the first time I made my cool whip icing (pudding, cool whip, milk) I loved it, and I couldn’t wait to use it on 2 specific things that I had yet to create…. Tiramisu and Black Forest Cake. Now I’ve created recipes for both of those, and they are among my favorites, so I hope you enjoy. This one is DEFINITELY a repeat. 1. Mix cake mix, egg whites, and cherry coke together. 2. Pour cake mix into a 9×11 pan coated with nonstick spray, and bake according to package instructions. 3. Allow cake to cool completely. I sped this up by placing the pan on a wire cooling rack after baking. 4. Spread contents of lite cherry pie filling can evenly over top of cake. 5. Mix cold milk and pudding mix with a wisk until it begins to thicken. Fold in whole container of coolwhip until the pudding and coolwhip are well blended. 6. Spread cool whip mixture evenly over the top of the cherries, and refrigerate cake. 7. For best results with this frosting, Refrigerate at least 2 hours before serving. Editors Note: If you really needed to eliminate sugar, you could use a sugar free chocolate cake mix, and sugar free cool whip here. However, I find that the sugar free cool whip does not allow this frosting to keep its texture as well as the lite or regular. It will still work. It just wont be as firm. 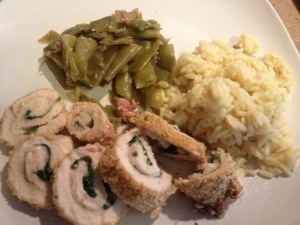 I adapted this recipe from one of my family’s favorites, chicken cordon bleu. I prepared all the ingredients to make cordon bleu tonight, before discovering that my husband had eaten all the ham! This was a great chance to improvise, so I did! 1. Preheat oven to 450. Spray a large non-stick baking pan with PAM. 2. wash and dry the chicken, and season with salt, pepper, and garlic powder. 3. 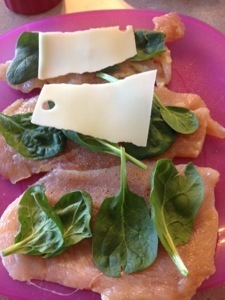 Lay the chicken flat on a plate, and lay a layer of spinach leaves, and a slice of cheese down the center of each breast. 4. Mix egg whites with 2 tbsp water. Set aside in a dish. 5. 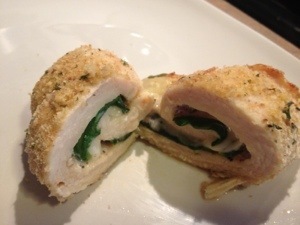 Tightly roll chicken breasts until spinach and cheese are tightly rolled in the center. 6. Holding the chicken “roll” tightly together, dip chicken into egg, and then coat with breadcrumbs. 7. Place chicken seam side down on baking dish. 8. Spray tops of chicken lightly with PAM, and bake 25 min. This is an Asian dish. The sauce is mild, and tastes a lot like the sauce you would find in beef and broccoli… In fact, it’s inspired me to try beef and broccoli soon. For now, enjoy this Yummy Chicken dish! 1. Mix 1 tsp cornstarch with 2 tsp soy sauce and mix until smooth. Add sliced chicken, and stir to coat. Refrigerate for 30 min. 2. In another bowl, mix remaining corn starch and remaining soy sauce together until smooth. Add broth and ginger, and set aside. 3. In a large non-stick skillet (with a lid) heat 1 1/2 tbsp. oil, and cook chicken until no longer pink. Remove Chicken and set aside. Now’s a good time to cook the rice according to directions on package. 4. Add additional 1 1/2 tbsp. oil to skillet and heat. Add onions and garlic, and cook, stirring, until Onions begin to soften. 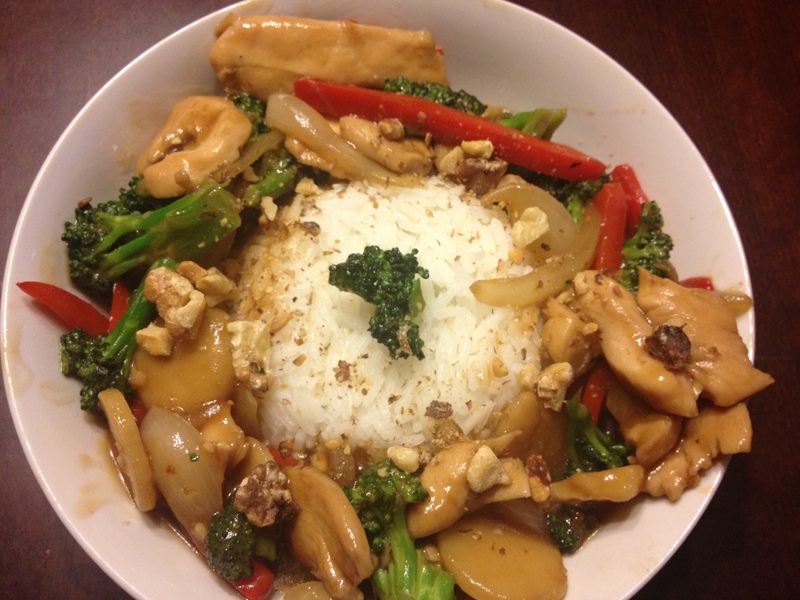 Add red pepper, broccoli, and water chestnuts, and continue to cook until vegetables are cooked, but still crunchy. 5. Stir broth mixture, and add to vegetables in skillet. Bring to a boil, stirring regularly, and allow to boil 2 minutes before returning chicken to pan. Mix well and heat through. 6. Serve with Rice, and top with walnuts. 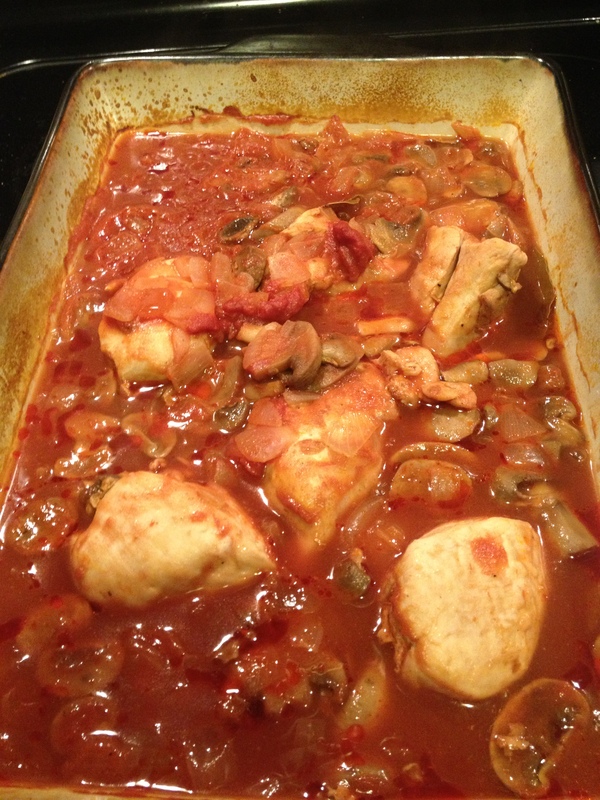 So, I adapted this recipe to be a take on the French classic, “coq au vin”… but, I didn’t call it that, because, I want to post a more traditional coq au vin at a later date… so for now, here is “Red Wine Chicken”. 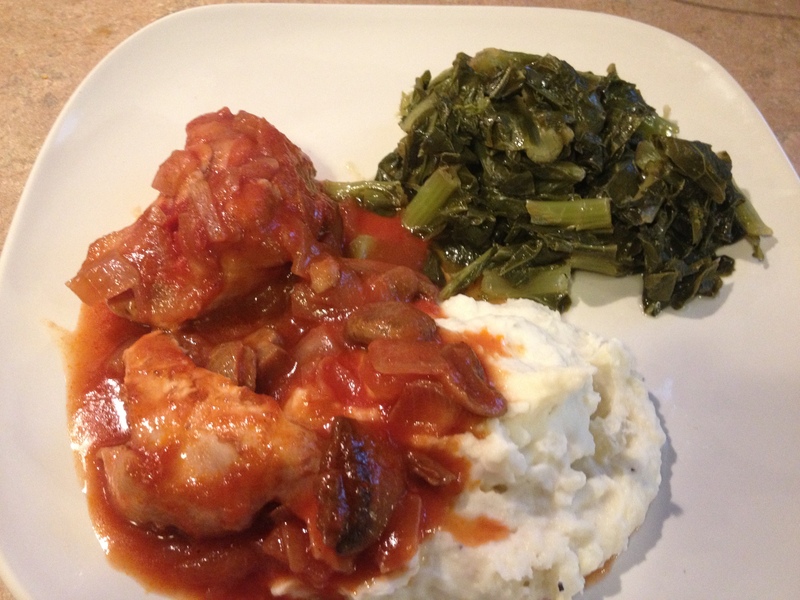 I served it with mashed potatoes, and collard greens. Note that I cooked this in the oven. You could replace the oven part with 6 hrs on low in a crockpot. If you choose to cook it this way, you may need to cook the sauce off in a pan afterward to thicken. 1. Heat oil in a large skillet. Add onions and chicken breasts. cook until onions are translucent, and chicken is brown on all sides, about 5 min. 2. Season chicken in skillet with salt and pepper. 3. Add all other ingredients to skillet. Mix and bring to a boil. 4. Transfer all contents of pan to a baking dish, and cover with foil. 5. Bake for 1 1/2 hours at 300 degrees. 6. Remove from oven. Remove bay leaves, and allow to rest for about 5 minutes. Sauce will thicken. 7. Serve over potatoes, rice, or noodles. 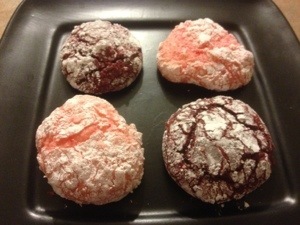 I made these in both Red Velvet and Strawberry for my daughters valentines day party at school. 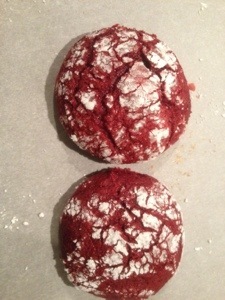 I really liked them both, but the red velvet were my favorite. These cookies turn out light and fluffy. You could do this in any flavor, and I’ve heard lemon is good. 1. Line baking pans with parchment paper. 2. Mix cake mix, egg whites, and cool whip together with a hand mixer. It will be very sticky. You may have to scrape beaters with a spoon. 3. Chill dough for 30 min or longer. 4. Use a small cookie scoop to form appx 1 tbsp scoops of dough. 5. Roll each scoop of dough lightly in powder sugar, forming a ball. 7. Bake 8-10 min at 350. Mine took exactly 9 min. Take them out before they turn brown. 8. Allow to cool 1 min on pan and move cookies to a cooling rack to cool. So, chicken noodle soup isn’t new to anyone, and it’s really pretty healthy no matter how you make it, assuming you don’t use a ton of butter or overload the noodles… so, here’s a recipe that I go to for comfort food on a winter day. 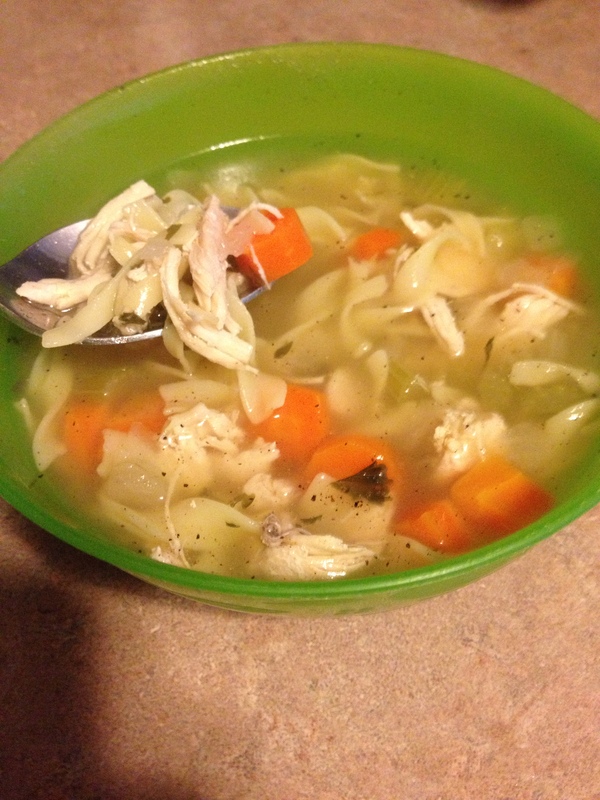 It’s predictably delicious, as most homemade chicken noodle soup is. Enjoy. 1. Place all ingredients, except for noodles into a crockpot. Set on low or 6-8 hours. 2. Remove chicken breasts and shred them with 2 forks. Return them to crockpot. 3. 30 min before serving, add noodles and stir. Cover and cook for 30 min. Editors note: I like to make mine in the crockpot, because I prefer shredded chicken, and this is the easiest way to get it. You could easily make this on the stove by just boiling all ingredients together and dicing the chicken up as well. This chicken is another one of those recipes that I wasn’t sure about, but after I made it, I really liked it. I particularly liked it with mashed potatoes and broccoli on the side. 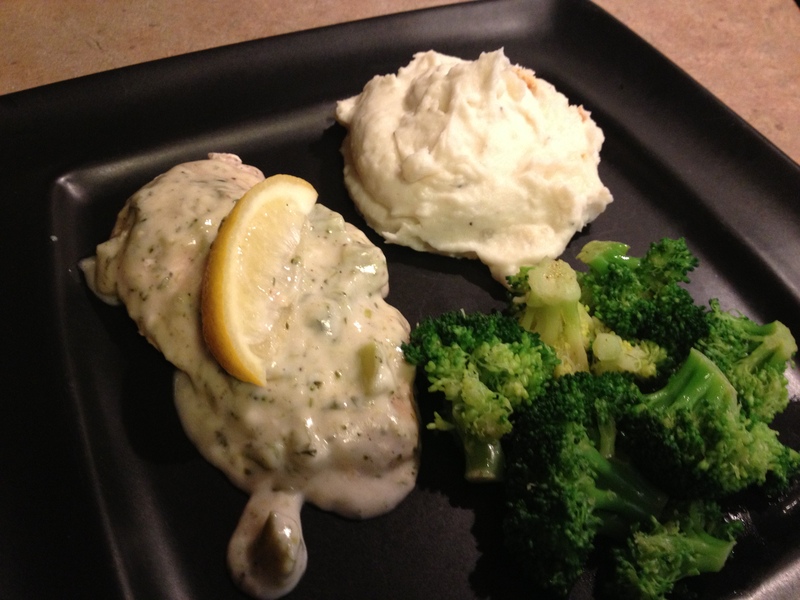 The sauce goes great with potatoes, and the broccoli was a nice compliment to the sauce as well. Enjoy. We’ll be making this one again at my place! Also, note that this isn’t overly lemony, despite the name. There’s a hint of lemon, but not overwhelming lemon flavor. 1. Salt and pepper chicken breasts to taste. 2. Heat oil in a large skillet with a lid. 3. Cook chicken breasts until done, about 10 min on each side. Turn and rearrange as often as needed. 4. Slice lemon in half longways. Reserve 1/2 of lemon, and slice other 1/2 into 4 slices. Set aside. 5. Mix soup, milk, parsley, pepper, Worcestershire sauce, and the juice from large side of the lemon in a bowl. Discard lemon half after juicing. 6. Pour soup mixture over chicken breasts, and top each with one of the 4 slices of lemon. 7. Cover pan and simmer on low for 5-7 minutes. Editors Note: If you don’t like broccoli, i bet cream of celery soup would work just fine.